View of the Mirabell Palace and its gardens. 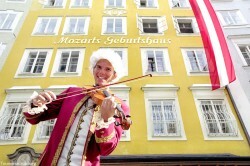 The Sound of Salzburg Walking Tour starts from in front of the famous Mirabell Palace. Today, the palace and its wonderful gardens are the home of the city government. But if you know where to look, you’ll find out that it is still a mighty symbol for classical music. There is the big marble hall – a location for chamber music events – as well as the palace’ gardens, in which several scenes of the Sound of Music movie were filmed. Right next to the gardens the “Mozarteum University of Salzburg” teaches approx. 1.700 students the legacy of the city’s most popular artist W. A. Mozart and creates a new generation of classical musicians every year. The modern building is one of the best universities in Europe for music and dramatic arts studies. 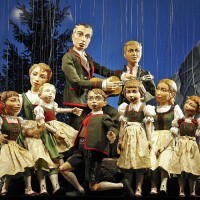 The next stop features a view of the “Kammerspiele”-theatre. 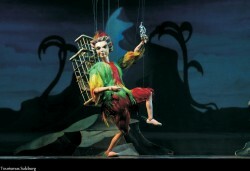 In here, the old art of puppetry still goes on like the times have never changed. With plays from legends like Mozart, Tchaikovsky, Rogers and Hammerstein the marionette ensemble abducts the audience into a world of a forgotten art. Just a couple footsteps away – on Makart Square – is Mozart’s residence. From 1773 to 1780 Mozart wrote a huge amount of his works in this very house. Today the landmarked place serves as a museum. The next meters include a crossing of the river Salzach – one of the reasons that helped develop the city – and a visit to Herbert von Karajan’s birthplace. It is also a very special place for getting a marvellous panoramic view of the historic center. Just a couple minutes from the river, the Sound of Salzburg Walking Tour hits the most bustling street of the city: the Getreidegasse. Not only is the street well known for shopping and dining, but the Getreidegasse also hosts a world-famous building. Because once you stand in front of number 9, you realise what a unique venue you just catched sight of: Mozart’s birthplace. Today this place is also a museum. 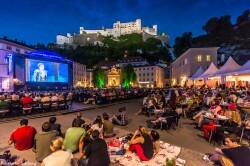 The festival in Salzburg attracts a big audience each year. As the tour makes its turn past the University Square and into the festival district, another well-known location to music-lovers comes into view. 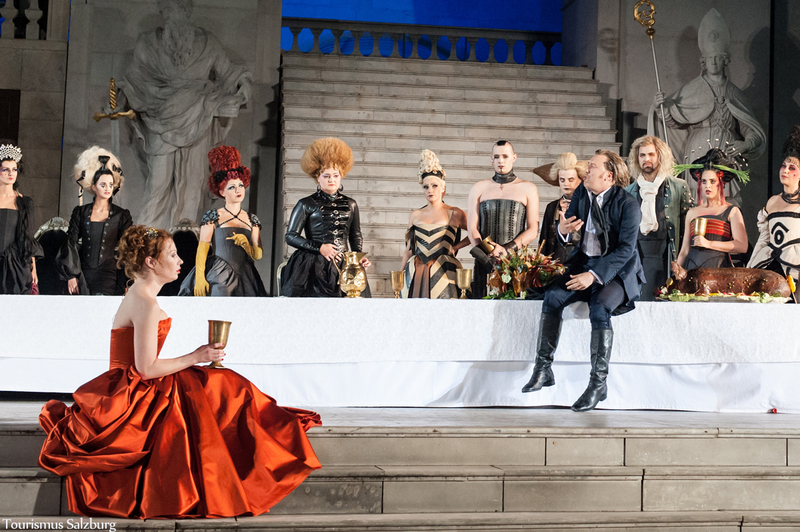 During the summer, more than 5.000 guests can listen to concerts and opera all around the district. 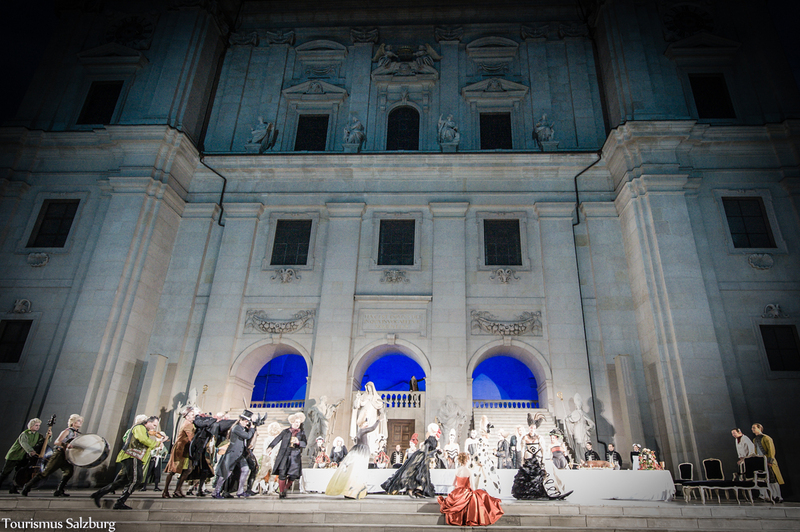 The very best performance takes place at the Kapitel Square during the Siemens Festspiele. On a huge screen visitors who couldn’t get a ticket can look at the play, all free of charge! Also, more movie locations will be shown here. One of the last stops is the oldest abbey of the town, which also houses the oldest restaurant in Europe: St. Peter Stiftskeller. 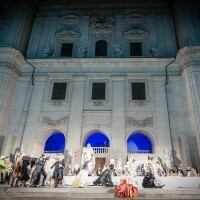 With frequent Mozart concerts and the still very active monks this one mustn’t be missed. 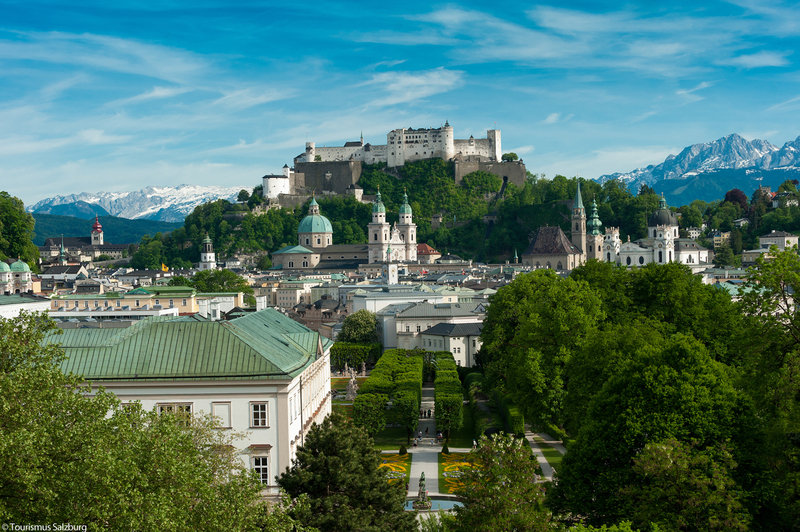 As the group looks up, the Hohensalzburg Castle shows off its mighty presence. The biggest fully intact fortress in Europe was built in 1077 and didn’t lose any of its glamour to this day. Back on the ground, the lucky ones might hear the Salzburg bell, telling the residents that it is time to eat. Speaking of which… better go ahead – dinner is waiting! Interested? Please, don’t hesitate to contact us! Is this a Guided Tour? Gather it’s not based on the Sounds Of Music?!! We were planning to do the Hop On Hop Off Bus in the morning. 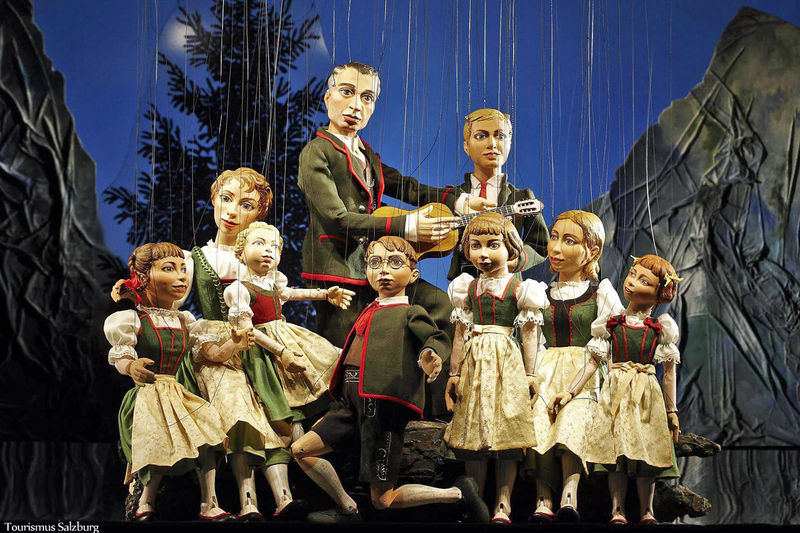 Have lunch and walk some of the Sound Of Music areas from 2 to 5pm. Would it still be practical to do this at 5.45pm. Or are we retracing the same areas? Thank you for your question and post. For tonight there are not enough registered guests for the walking tour, so we drop it. 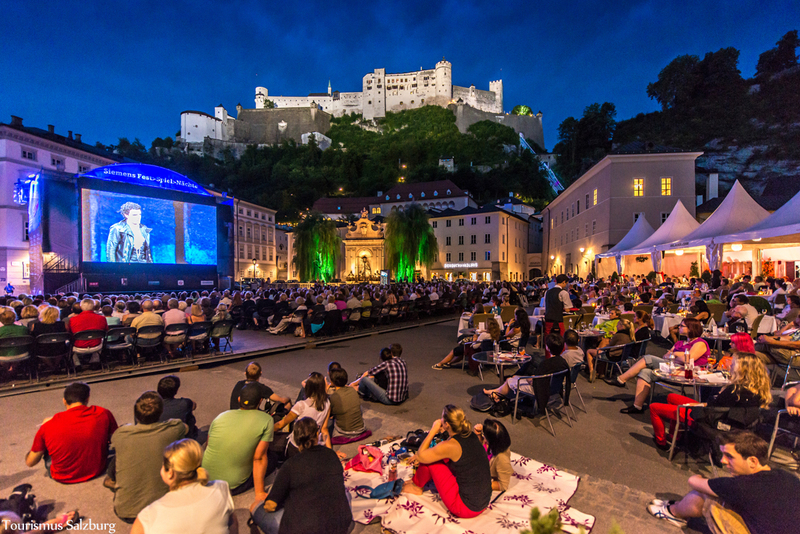 If you have another day in mind, please don’t hesitate to contact us again here, via e-mail (office@soundofsalzburg.info) or preferably via telephone: 004369910248666. We hope to hear from you again. 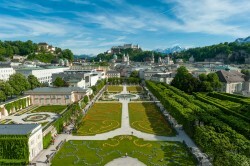 Enjoy your stay in Salzburg!